Mains Tester Plug Tests Supply Live, Neutral and Earth Connections. 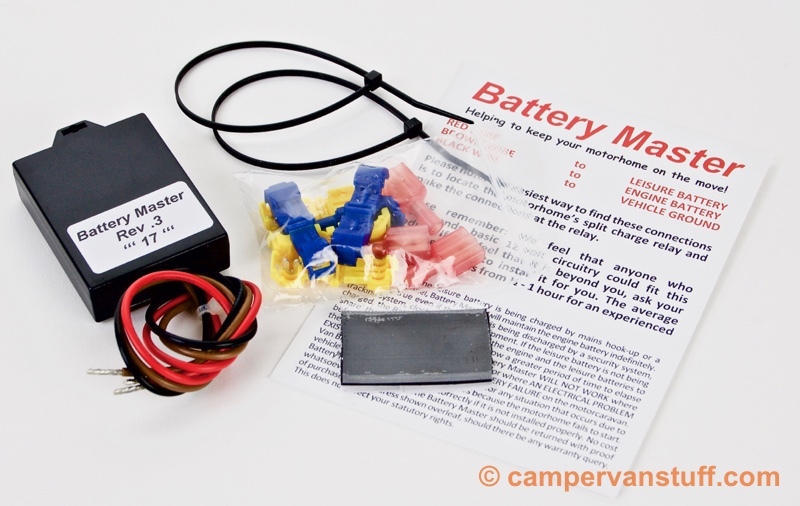 The Battery Master keeps your engine starter battery safely topped up by linking it to the leisure battery. Its automatic one-way action will pass a small trickle charge to the engine battery whenever its voltage becomes less than a defined level below that of the leisure battery, so that the engine battery is kept in the best condition for easy starting and a long service life. The Battery Master will not allow any charge to flow in the other direction, from the engine battery to the leisure battery. Battery Master addresses an issue which is inherent in the way that modern motorhomes are often equipped and used: the leisure battery gets a lot of attention (naturally since it plays a vital part in running the equipment which keeps you comfortable in the living area) but the engine battery is left to fend for itself when the vehicle is not running. Your vehicle is likely to be equipped with a hookup, and maybe a solar panel or generator, which keep your leisure battery charged, and you'll probably have instrumentation which monitors the state of charge of the leisure battery. So the leisure battery can cope with long periods when the vehicle is 'parked up' and not being charged from the engine alternator. On the other hand, the engine battery is quietly being drained by small loads which are drawn by the vehicle's standard electrical system even when the vehicle is not being used, and by self-discharge. 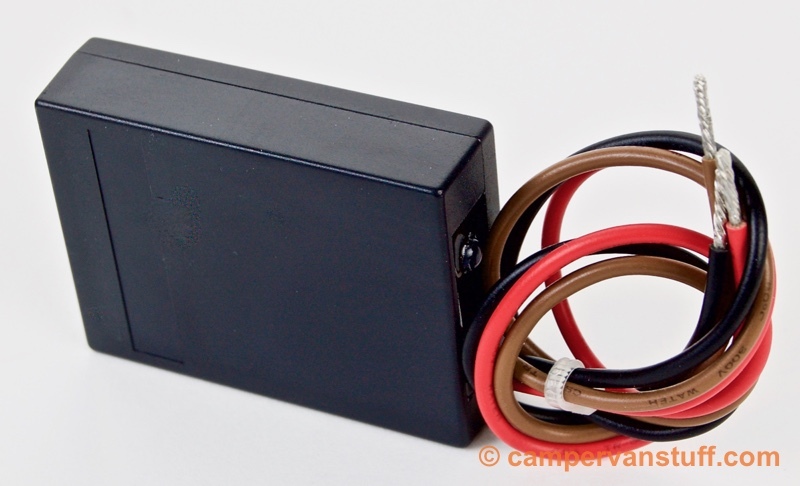 If you have added an alarm system for the motorhome then that increases the drain and the battery can lose charge quite quickly to a level where starting is jeopardised. Batteries which are allowed to become too discharged without prompt recharging will be permanently damaged. And usually there is nothing to warn you that this is happening, since the vehicle most likely does not have instrumentation to display the engine battery's state of charge. Battery Master has a maximum charging current of 1.1 amps which is designed to cope with these low-level losses from the starter battery. Fully waterproof, British made and designed, Battery Master is easy to install and comes complete with instructions, and for fixing it has a self adhesive / velcro-type pad and tie wraps. It also includes a selection of cable connectors but you might need something different depending on your own installation conditions. We decided to install a Battery Master in our own motorhome because its function offers just what we want. Our motorhome is fitted with a sophisticated alarm system which adds to the starter battery drain; we have monitored the battery voltages and we find that after less than a week of the vehicle not being driven, the starter battery voltage will fall below 12.7 volts - a level at which the deterioration of battery service life increases. Fitting was very simple. The unit has three short leads which connect to the starter battery positive; the leisure battery positive; and to the vehicle earth (negative). The instructions advise that the ideal way of achieving this is to make the connection at the relay which controls the output of alternator current to the leisure battery when the engine is running: this relay is necessarily already wired to the positive terminal of the engine battery and the output side of the relay is likewise already wired to the leisure battery. Our relay was located inside the living area close to the leisure battery and was easy to get at; an earthing point also was availabe close by so no extra wiring was required. All we needed was three crimp-on ring connectors for the wire ends. We used a basic multimeter to test the voltages either side of the relay: by comparing these with the voltages of the leisure and engine batteries we could be sure which side was which on the relay, before attaching the wires.